Though clear evidence is emerging that MH17 was shot down by a Ukrainian Fighter Jet; followers to my twitter feed know that on July 19 I stated after seeing a BBC (on ABC and SBS ) report that eyewitnesses claimed to have seen a small jet leaving the vicinity of the airborne explosion. Followers to my twitter feed will have seen on July 19 my report of the eyewitness report and my speculation it was one of 2 SU 27s. The most recent evidence shows it was an SU25. 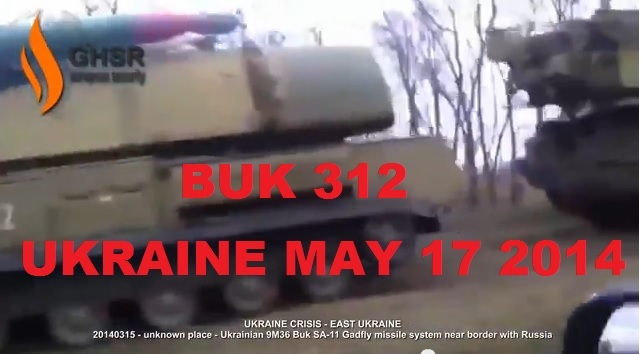 Remember 312 was identified as one of 3 BUK M1s (Gadflys) that entered Ukraine from Russia a week before the attack on MH17. 312 then shown on TV channels as leaving on a low loader back to Russia minus 2 missiles.